A church is a special place and St Nicholas’ Church, at the centre of our village community, is a particularly special place in which to get married. The setting could not be more attractive – the ancient building itself, the Garden of Remembrance just opposite for photographs and drinks outdoors, the proximity to our Church Hall, easy parking in the nearby village car park – all add up to a stress-free day. 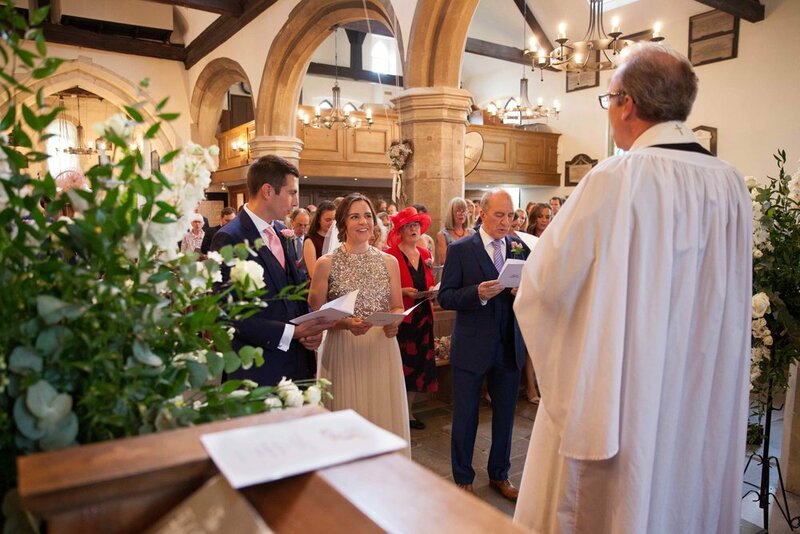 The wedding ceremony is set by the Church of England but you can choose your own hymns, readings, music and flowers, providing that one of the readings is from the Bible. Here at St Nicholas’ we encourage a relaxed approach, whilst respecting the ancient traditions of our Christian heritage. Do come and see for yourself – you will not be disappointed! Who can get married at St. Nicholas? You need to live in the parish, or have a qualifying connection with the church. If you are not sure, contact the parish office, and we can advise you about your eligibility. Visit the Church of England website for information on legal aspects of getting married in church, and to find out all about planning your ceremony. The Church of England website also has some helpful information and ideas on music for your service. These are read out three times in church. Please ask your guests not to use confetti unless it's biodeogradable!